The Classic Word Studies Collection from Kenneth Wuest! This collection offers a wealth of information covering most of the original New Testament--all in non-technical language! Now even Bible students who don't know Greek can discover the wealth of truth and meaning in the original language of the NT. Wuest's commentaries and studies clarify many of the English words that do not fully capture the meaning of original Greek words. The topical word studies, devotional studies, and commentaries opens a doorway of discovery to the NT! - Wuest's commentary on these NT Books: Mark, Romans, Galatians, Ephesians, Philippians, Colossians, 1 Timothy, 2 Timothy, Titus, Hebrews, 1 Peter, 2 Peter, 1 John, 2 John, 3 John, and Jude. These will appear as a commentary module in e-Sword. - Six Wuest reference books: Bypaths, Golden Nuggets, Great Truths to Live By, Studies in the Vocabulary, Treasures, and Untranslatable Riches. These are accessed in your e-Sword Reference Library. Be sure to obtain the companion Wuest - The New Testament: An Expanded Translation for e-Sword. The downloading facility was excellent and so quick. I have used Wuest's Word Studies in the New Testament for decades, and have found them to be an invaluable help in my studies. An essential study help for any serious student of the Word of God. The insights, definitions, and word usage is excellent. As a new pastor I find myself counting his work as a reliable source of information worth sharing from the pulpit! Won't be without it. E-sword has been a tremendous help in my study of the scriptures. There are no complications with in searching the various ‘helps’. These studies originally came in the form of several books, which I have had for over 40 years now, but bringing this into eSword has made it so convenient. This is a "drill down" commentary that contains so many gems and for the price and convenience, it can't be beat, in my opinion. Best word study ever!! My pastor told me about this word study. He told me I would love it and he was soooooo right! Amazing study of the Greek words of the New Testament. Wuest's clarity to the Word gives a much broader picture, greater understanding of what God is saying to us. I was trying to order the books online and they were on back order. Was so excited when I saw that e-Sword had all 4 volumes. Needless to say I canceled my back order. I already was in love with e-Sword so now it is over the top! Love having everything in one place and able to easily access all books with a click of a button. Wuest's Word Studies in the Greek New Testament is very helpful and it has a very in-depth explanation of every bible verse in the New Testament. I am helped very much when I read and study bible as well as I prepared for my preparation for teaching and preaching. I recommend this material to all who want to delve into the word of God in the New Testament. "Wuest-Word Studies" is a great resource! When I consult his word studies, I always recieve helpful insights that open up the true "LIFE AND BLESSING" contained in the passage. I have learned this in this that I didn't know and it's been life changing. Very good word study commentary of the New Testament. This is a great companion resource to Wuests expanded translation of the Greek New Testament. In these volumes you will find easy to understand definitions of Greek Words that enhance your studies whether personally or in the preparation of sermons. A friend gave me the physical books and I was so impressed by how much the add to my studying that I had to have them as an addition to e-Sword. I've read (and re-read) most of these books in paperback form. They are great if you want to understand original meaning of the Greek New Testament. I love to study word meanings and different tenses of Greek verbs and so forth. This is a perfect tool for that type of study. 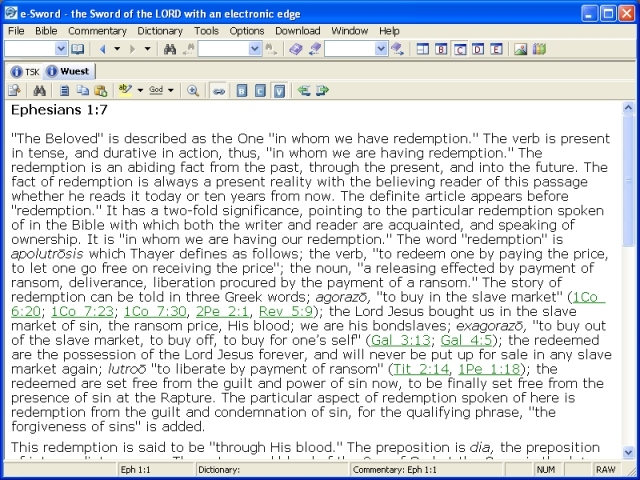 E-Sword to me is by far the best Bible software I have ever used. I liked the early versions when ever thing was open to download freely. Not that I'm opposed to paying, but you can buy a lot of software you never use. If you could use before you buy to see if you like it, that would be great. E-Sword you nailed it!!!! I have always appreciated Wuest's work but didn't have a copy. Now I do, thanks to eStudySource. This is worth the money. It is a good solid, conservative study resource for the NT. Highly recommended. You get many Greek resources that Dr Wuest did in this buy! It's well worth the purchase for the one who wants to study God's Word. His other resources that you buy with this study will be located under the "resources" area of your e-sword app. It's OK...I wish it covered all of the NT, but it only covers selected books. I enjoy his comments until he begins to add Calvinistic slants on his interpretations, because they are usually incorrect according to a complete Biblical Hermeneutic. Very helpful,easy to use,full of insight, well worth the investment!!!! I already had WWS in the Greek New Testament. Since down loading WWS I have put the books on the shelf. I have always liked Wuest's books but enjoy the online version best. I can copy selections and save time. I would highly recommend this download. In my opinion it is a GREAT investment. This adds so much clarity to what I am reading. So glad I purchased it. This set is an excellent word study but the format is difficult as you do not have access to contents with out a scripture reference. That fact limits your search of the contents. Not real happy with it because of that. This is a wonderful commentary and word study edition for the serious novice, no degrees needed. Great insight and excellent information about words, intent, and meaning. I have used this for years, and the covers are falling off the books, so it is really nice to have an electronic version that adds depth to Bible study and just personal snooping around Scripture and chasing down those pesky rabbits. Wouldn't be without it! I love that e-Sword is offering the Wuest studies in addition to his Expanded Translation. By being able to reference his commentary, one is able to see WHY he chose to translate as he has. It has already proved helpful in unlocking the richness of NT Greek. Have been looking for further resources for Bible study. Search has led me to Wuest who worked on NASB which I liked. Since I did not plan to learn Greek, I am hoping these studies will give me edification where I need it. Wuest-Word Studies is a must have for any serious Bible student. I have personally used these studies for many years and found them extremely helpful in understanding the New Testament so helpful that I have a copy on eSword as well as a well worn copy beside my bed. The only disappointing feature is that they do not cover the whole of the New Testament. If you buy remember that like any other work of man it must be checked thoroughly and not accepted blindly. Be like the Berean Christians and search the Scriptures daily to see if these things are so. Do this & the user will find these are invaluable helps for Bible study. This is a great product, there's so much valuable information and reading, I hope you buy this too! I live in China where the availability of products for one to study the word of God is VERY limited, as always I find the sources for e-sword to be of the greatest importance. If you're reading this comment please think about how fortunate you may be to live in a country where you can access the word of God without restrictions. Although somewhat dated, Wuest's word studies on the New Testament Greek text for English readers are still an invaluable resource for the Bible student. Using E-Sword ESV, Greek, Gk Bzt+ alongside each other, it is great to be able to switch to Wuest in Commentary for information on the use of the greek terms in that verse and also have a devotional emphasis. I highly recommend this extra purchase. When used in tandem with the Wuest Expanded NT, this is an essential study tool since it sheds further light on the meaning of passages by expounding the significance of the words the Holy Spirit chose. This is a very valuable resource. A very useful and professional text for serious Bible study. I recommend it to anyone willing to really know what the Bible says. I purchased this e-Sword version of Wuest's Greek NT because of prior use and high recommendations for its help to understand the Greek meanings more accurately. I consider the price a bargain, and I have used my e-Sword software extensively for about 3 years. It will my main source for preparing my NT study materials. Thanks for making it available. Weust's Word studies is a super valuable tool, especially for those who aren't proficient in Greek. There are so many words in English that do not adequately convey the original meanings and also verb tenses in the Greek can dramatically shift our thinking on theological interpretations.I highly recommend this tool for anyone wanting to really study and "rightly divide" the Scriptures. Have used this product in book form before but its so much easier eletronically Nothing like access to the home language the bible was written in. Mr Wuest comments are a bobby dazzler. (beautifuland profound) and he seems to quote from other Greek experts. Some deffinitions of words cover paragraphs. No milk and water here cobber!. Make sure you have a good set of teeth o chew this meat. A little beauty i will end by saying. Wuest Word Studies and its companion, The New Testament: An Expanded Translation are two resources that every Bible student should consider, especially if not skilled in Greek. For example, John 21:15-17 makes no sense without recognizing that the word “love” Jesus is using is NOT the same word Peter is using. Wuest clarifies those words for the reader and the passage comes alive. Here it is: John 21:15 Wuest (15-19) “Then when they had breakfasted, Jesus says to Simon Peter, Simon, son of Jonas, do you have a love for me called out of your heart by my preciousness to you, a devotional love that impels you to sacrifice yourself for me? Do you consider me more precious and thus love me more than these ? He says to Him, Yes, Lord, as for you, you know positively that I have an emotional fondness for you. He says to him, Be feeding my little lambs. He says to him again a second time, Simon, son of Jonas, do you have a devotional love for me called out of your heart by my preciousness to you, a love that impels you to sacrifice yourself for me? He says to Him, Yes, Lord. As for you, you know positively that I have a friendly feeling for you. He says to him, Be shepherding my sheep. He says to him the third time, Simon, son of Jonas, do you have a friendly feeling and affection for me? Peter was grieved that He said to him the third time, Do you have a friendly feeling and affection for me? And he said to Him, Lord, as for you, all things you know positively. "You know from experience that I have a friendly feeling and affection for you. Jesus says to him, Be feeding my sheep. Most assuredly, I am saying to you, When you were younger, you were accustomed to clothe yourself and to walk where you were desiring to walk. But when you grow old, you shall stretch out your hands, and another shall bind you around and carry you where you do not desire. And this He said, indicating by what kind of death he will glorify God. And having said this, He says to him, Be following with me.” WUEST IS WORTH SO MUCH MORE THAN IT COSTS—IT WILL CHANGE THE WAY YOU UNDERSTAND THE TRUTH OF GOD’S WORD. I have the Original (book) four-volume set by, Dr. Wuest. Its great to know and see this series has been digitized for my laptop. Now, I can continue my studies, while on the go, on the road, out of country, or in my vehicle. The clarity of GOD's Word, continues. This resource is a wonderful help in the in depth definitions. I always look to see what Wuest has to say. I already had the hardback copy of this product and greatly enjoy it. So when I found out that it was available on e-sword I had to have it. It's made it so much easier to use. It is a valuable addition to explore the original usages of the Greek text. To have this on i Pad saves so much time, being at the ready wherever reading the translations. The hard copies of these books have been used since 1961. So convenient to use this latest addition to eSword resources. Have used K Wuest since mid 50's; learnt great depths and insights into the NT ! Best of all its now in Software format so its so easily accessible. Thank God for what He has done thru KW; Its a pity that he did not complete the whole of the NT books! I'm thrilled that e-Sword has added Wuest's Word Studies. This set was my first introduction years ago to the riches of the meaning found in certain Greek words in the original text of the New Testament. I own the set in hard copy, but this now allows me access to it on both my home and office PC. Thanks e-Sword! I recommend this set without reservation for every believer who wants to dig a little deeper in their studies of God's Word. Allow plenty of time!!! Dr. Wuest's writing is rich; his depth and insight are breathtaking... Despite the tremendous scholarship presented, the text is remarkably comfortable to read... The module includes Mark's Gospel, most of the Pauline letters, the letters of Peter, John & Jude... If studying Matthew or Luke use the "Harmony" choice under the "Bible" menu item to visit the Gospel of Mark for Dr. Wuest's remarks on the very similar passages... Would have loved to have Dr. Wuest's insight on the Thessalonian letters and Revelation, but STILL WORTH ALL FIVE STARS!!! I was familiar with Wuest Word studies since I have the hard cover volumes, it is great to have them integrated I to my eSword bible on my iPad!!! I started to read my father's Wuest books 40 years ago as a boy and I attribute a lot of my early understanding of Greek to him. I bought my own set of books when I got married 30 years ago. Now I have purchased the e-version. It is great to have instant access to the relevant portion of study and his 'expanded version' always provides clarity. I have just read Hebrews and have gained so much through the simple, yet in-depth, exposition and translation of the book. It does not take intellect to read the book so all brain-energy can be put into understanding what is taught. It is a brilliant balance where the truth is still profound but it is now attainable! Praise the Lord for men like Wuest! Have used this resource for many years. It is a resource that I have on my bookshelf. Much easier to use in the electronic format. I have found the Wuest Word Studies well worth the small amount of money paid. My first stop by him was to look into Gal 4:19 "my little children, for whom I am again in the anguish of childbirth until Christ is formed in you"! Great insight into the "work" relationship between Christ and the Holy Spirit. I have used Wuest's for almost 30 years and never cease to be amazed and blessed at the knowledge gained by his studies. It really helps one's growth in the Word, but I believe in one's affection for the Lord as well. The nuance of words and phrases in the Greek come alive and lend weight as to the meaning and intent of the writer of Scripture. We are referring to Wuest's exposition in our study on I John with young believer's and it's thrilling to see their eyes light up, and enjoy the amazed look on their faces when they see the depth of meaning in the Greek. It is a tremendous boost to their understanding of God's intent with their lives. I heartily recommend this work to anyone. Wuest's commentaries are su[erb and filled with insights into the details of the meaning of Greek words. An excellent commentary. Anything with the venerable Kenneth Wuest's name on it is going to be outstanding! The ability to refer to his comments without having a copy of his word studies handy saves me a lot of time. Having his studies at my fingertips- Priceless! I have been using Wuest's commentary and Expanded Translation for 30 years, and it is an utter delight to have it in E-Sword and searchable, along with the Expanded Translation which I also downloaded. Wuest included the English understanding of the Greek Verb tenses in the text, and maintained much of the sentence structure as well. The combination does not make for fast reading, but, it makes for excellent understanding of the language. This is a great asset! As a young Christian Mr Weisbe's commentaries were published as individual books the 'Be' series.They were recommended to me by an older Christian as helpful insights to the Scriptures. I want to now reccommend them to others, especially young Christians, they are written in a way that is easily understood. I was so glad when e-Sword included them in their "comentaries" I downloaded them as soon as I saw them. I now don't have to take the books with me when I travel as I have downloaded them to my laptop. This commentary is so helpful for a young Christian that I recommend that you get it as soon as you can it will help you greatly in your study of the Bible. They are helpful for older Christians as well, I have the hard copies beside my bed and often refer to them, at 74 I am nearly getting close to the 'older' group myself and I still enjoy them possibly even more so as I can follow his line of thinking more readily now. I still often get a little 'seed thought' that I can build on. If you get this Commentary I know from my own experience that you wont be sorry that you have them in your library. I have most of the e-Sword Commentaries on my computer but I still refer to this one the most. WARNING, This Commentary while excellent should NOT take the place of the Bible. Study your Bible diligently and use Commentaries only as a help AFTER you have finished your own study. I pray that this will be used of the Lord to help others Christians to "grow in grace and the knowledge of the Lord Jesus. I have used the Wuest's Word Studies in the New Testament in my study and sermon preparation. His insight into the nuances of the Greek language brings a passage or a particular word to life. And now to have this tool as part of the e-sword package adds a greater dimension to in-depth Bible study and exegesis of passages of scripture. Great product. I first came across Kenneth Wuest's work about 45 years ago, when I lived in Canada (I still have the printed version). I highly recommend the e-Sword version, which I have also purchased. The serious Bible student will find his comments invaluable. I tested Dr. Wuest's exposition of a critical text, and found it to be accurate, clearly expressed and clarifying as to the Greek meaning. As you might imagine, "discovering" e-Sword as a computer-based resource was a massive blessing, as all our preparation and publishing is done on computer. The Lord bless you both as a ministry and as individuals, good measure, pressed down and shaken together. You may not realise just how much e_Sword enriches the Body of Christ, but it does play a very special role. Wuest Word Studies is a must as far as resources are concerned. Together with the Expanded New Testament? What a "team"! Love it! Great resource for the serious student. I have loved and appreciated Wuest's Word Studies in the Greek New Testament for years. I am so thrilled to finally have it available in the easy-to-access and ready-to-use format of e-Sword! This is just an outstanding source of revelation and insight into the original Greek language of the New Testament. The reader will find a rich mine and well of applicable truths to apply in one's own life as well as to share with others. I believe every pastor and Bible teacher should have Wuest's Word Studies in the Greek New Testament! You will continually find fresh and new insights and revelation. Believe me, you will NOT be disappointed. A great buy!